Geek Lit Etc. : Manga Monday: What in heaven is the monstrosity on the cover? While Eren is still resting from his encounter with the Female Titan, the rest of the Survey Corps certainly has its hands full. Wall Rose has been breached, and orders are to help with the evacuation of civilians. Both Connie and Sasha are from the area, and so for them this mission is even more personal. We finally get Sasha's backstory, and get to see how she became 'potato girl.' Having been raised in the South, food became scare when she was younger, and she never quite got over the scarcity. Her speech mannerisms are explained as well, as she does her best to sound more educated and less like a country bumpkin. It's great to see a fan favorite character get to shine as she does here. Connie's return to his natal village, however, is much more disturbing. Here, the Survey Corps encounters Titans more monstrous than anyone has ever recorded before. And what Connie finds waiting for him at his parents' home is...disturbing. As we discover more and more different Abnormal Titans, it seems as though there may be more to the Titan plague than originally met the eye. 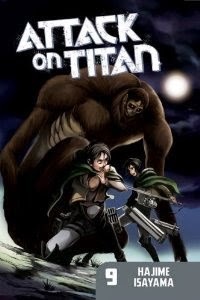 With some Titans clearly being transformed humans, and others...perhaps not...the mystery goes deeper and deeper with each chapter.